The prolific students from DigiPen Institute of Technology created another amazing and free PC game for all of us to enjoy. 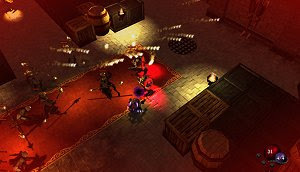 Deity mixes concepts from games so dissimilar such as Diablo, Torchlight and Batman: Arkham Asylum, blending the isometric perspective from the first two with the stealth action elements from the acclaimed Batman game. The engine was entirely built from scratch so that the developers could create the dark fantasy atmosphere they hoped for, starring a demon as the anti-hero in search for revenge. The demon has some unique abilities such as using the light to travel undetected by enemies. The entire game is controlled using only the mouse and although the levels become more and more complex, Deity may be completed in about an hour or so. It’s entirely worth your time, not only due to the great 3D visuals but also thanks to the original concept.